Love fajitas, but not the calories? This Fajita Salad is for you. Fresh romaine, corn, olives, chicken, tomatoes, red onions and peppers make it hearty enough for a main dish, but light enough that it's still healthy and ready in 20 minutes. This Chicken Fajita Salad makes a perfectly healthy and hearty lunch or dinner. The best part is that it only takes 20 minutes to make from start to finish. We also have a beef fajita recipe that we cook in our slow cooker, so be sure to check that out. Start by browning chicken in a skillet over medium heat until it was cooked through. To save time, cut the chicken into bite-sized pieces before cooking so it will cook quickly. After the chicken is cooked, throw some sliced green bell peppers, sliced red bell peppers and red onion into the skillet to tenderize a little. It’s important that the peppers and onion still have a little crunch to them to add some texture to your salad. Remove your chicken and vegetables from heat and stir in a little taco seasoning. We used about half an envelope of taco seasoning and it was perfect. In a large bowl, combine the lettuce, corn, olives and tomatoes. Top with your cooked chicken and peppers and then serve with your favorite salad dressing (such as a chipotle dressing). If you have a homemade dressing you like, that would work great but store-bought works just fine for this recipe. How long can I store salad in the refrigerator? Every salad differs, but I recommend only storing this salad for 1-2 days. If you are storing this salad in the fridge, make sure that the chicken and vegetables are completely cooled to avoid it getting soggy. With any salad, I recommend not dressing the entire salad if you are planning on having leftovers. Set the dressing to the side and allow others to dress their salads individually then store the undressed salad in an airtight container in the fridge. Can I make this CHICKEN Fajita salad ahead of time? I love making dinner and salads ahead of time to make things less stressful before it comes time to eat. This Fajita Salad can be made ahead of time, but I recommend storing the chicken, pepper and onion mixture separately from the lettuce and other ingredients and tossing right before eating it so it won’t be soggy. Skillet – I love that this skillet is nonstick and the handle never gets hot. Cutting Board Mats – With all of the slicing and chopping this recipe calls for you will want a cutting board. I love that these cutting mats are thinner so they are easier to store and wash. I use them every day. Glass Salad Bowl – You will need a large bowl to toss and serve your salad in and this extra large one is perfect. It also includes a lid which makes transporting salads to parties and potlucks so much easier. Love fajitas, but not the calories? This fajita salad is for you!! 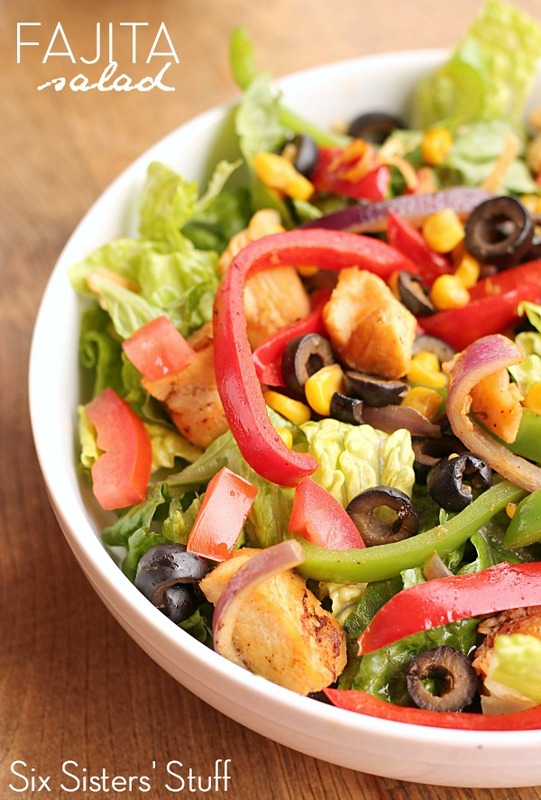 Fresh romaine, corn, olives, chicken, tomatoes, red onions and peppers make it delish! In a large skillet over medium heat, brown chicken in olive oil. Add in peppers and onion until they start to get a little bit tender (you don't want mushy peppers on your salad). Remove from heat and stir in taco seasoning. In a large bowl, combine lettuce, corn, olives, and tomatoes. Add in the chicken and peppers. 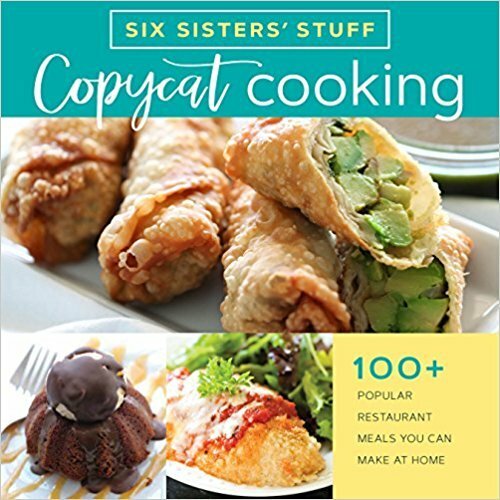 last night I purchased both 50 slow cooker meals and 75 freezer meals Ebooks. I received the link to download but said it was expired. Each time I respond to yall through the email provided it sends me another link to download those Ebooks....but, links are also expired. Please help! Yum! Cant wait to make this for the week's lunches! Hi, I am a young 61 yrs old. I found P then I found you six sisters. I never have cooked in my life. Now some switch inside of me just turned on. I have tried a few of your reciepts and can’t stop cooking. Ha! Who knew! I want to thank you from the bottom of my heart. I am loosing weight, and have found a new hobby. I have one sister left. Go Sisters! !